At F&W, we name America’s 10 most brilliant up-and-coming chefs every year. 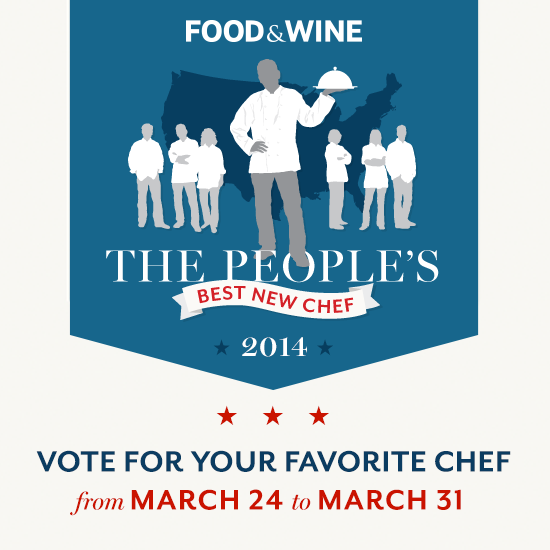 Now we want to know who you think is the most talented new chef in America. Why He's Amazing: Because as the seasons change, the dishes he creates with each day's produce are rarely what you'd expect. For example, springtime: sweetbreads with bucatini and rhubarb agrodolce. Why He's Amazing: Because not only does he conceive of the concepts for Next's over-the-top theme menus (Paris 1906; Childhood; Kyoto; Vegan—to name a few) with chef Grant Achatz, he makes them happen, and they are unforgettable theatrical—even emotional—experiences. Why He's Amazing: Because the food he cooks at Fat Rice (based on that of Macao, which melds the Chinese, Portuguese, Malay and Indian flavors of its colonial history) is amazingly innovative and fun. Why He's Amazing: Because his superlative food melds Vietnamese flavors from his childhood with French and Chinese cooking techniques, resulting in stunning dishes like garlic chicken prepared Peking duck style. Why He's Amazing: Because in a restaurant world that continues to trend toward casual, he's keeping fine luxurious dining alive and well in Chicago. Why He's Amazing: Because he's helped make Indianapolis a foodie destination by offering an exceptional gastropub menu. Why He's Amazing: Because he pioneered Cleveland's acclaimed food-truck scene with his quirky takes on American comfort food, now featured at this brick-and-mortar spot. Why He's Amazing: Because he translates his training with haute cooking titans like Paris chef Yannick Alléno into opulent yet playful dishes. Why She's Amazing: Because she's updating familiar comfort foods with global flavors (like harissa, za'atar and garam masala), and the results are incredibly addictive. Why He's Amazing: Because he's expanding Indianapolis's food scene with the kind of boldly flavored Asian street food that was once hard to find outside L.A. or New York (or Southeast Asia).